The 25th annual Ohio Tournament of Champions is looking for wrestling club wildcard entries. The event will be held at the Columbus Convention Center in Columbus, Ohio, on April 22nd. Tournament director Bart Freidenberg has provided the following information on the event, as well as wildcard entry information. More information may be found on the event's Website, at www.ohiotofc.com. "This year marks the 25th Anniversary of our event, which many refer to as one of the toughest, and best run, post season wrestling events. This coming April 22, we are anticipating closing out the entries, once we reach our goal of 3000 wrestlers. Initial registration will close out on April 15, with extended registration ($10 late fee) going thru April 17, provided we have not closed out. To be on the safe side, I would recommend you tell all interested parties to register and pay for the event by April 10. Last year, we received 800 entries during what would amount to the extended registration period. We are guaranteeing a total of $6000 in grant money, to be given to the top 5 placing Regions, based on their top 25 place finishers. The “First Place Region” will get $2500, 2nd Place $1500, 3rd Place $1000 and 4th & 5th Places $500 each. We anticipate the extended late entry fee, of $10 per entry in the final two days of registration, to cover this cost. If not, we will still guarantee the above amounts. If we exceed this amount, then the additional money will also be allocated to this. At this time, we are not sure if the amounts will go up, or if we will add additional regions to win grants. We have done our best to find region reps in all regions and currently have 49 states (only missing Mississippi) represented. Hence, we are anticipating a lot of new faces at this year’s event. As for the tournament itself, we will be placing the top 8 wrestlers in all age groups, including the Open Division. Besides the event awards given out (first place will also still receive a custom “Champions” wrist watch), all placers will also receive a special 25th Anniversary medallion. Also, should you have any suggestions for officials, please have them get in touch with our Head Official, Jack Kruse, at (krusejack@gmail.com). Generally, about half of our officials are from out-of-state and we are always looking for additional well qualified referees. A reminder that we also still have Club/Team Competition, again based on wrestler’s individual place finishes. 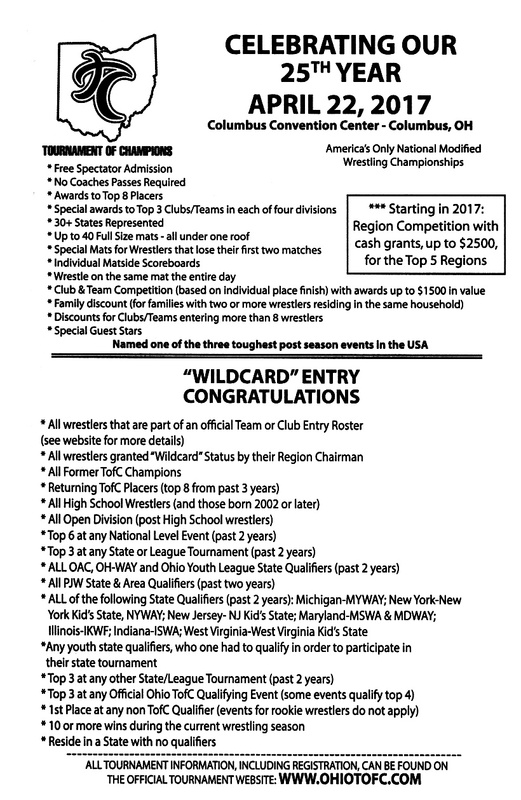 Clubs or teams that enter MUST be actual clubs/teams and all representing wrestlers MUST be regular members of that entity (i.e., practice on a regular basis). In other words, we do not accept all-star formed teams to compete for the additional Team/Club awards. Unlike last year, when there was a LOT of confusion over which Division to enter, we have simplified things. Teams/Clubs will enter the Division in which they wish to compete for a certain prize. Hopefully, the larger and more competitive groups will compete for the largest prize ($1500 in free gear from 3x Gear), and so on."